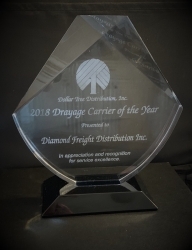 Diamond Freight Distribution is named the 2018 Drayage Carrier of the Year by Dollar Tree Distribution Services. Partnering with industry leaders, such as Dollar Tree Distribution is what continues to drive their growth and strategy in the transportation and logistics industry. Newark, NJ, April 13, 2019 --(PR.com)-- Diamond Freight Distribution is proud to announce it has been named the 2018 Drayage Carrier of the Year by Dollar Tree Distribution Services. Since 1988, Diamond Freight has partnered with companies like Dollar Tree to provide customized, dependable transportation solutions out of the Port of Newark and surrounding area. “Our team is extremely honored to be named Drayage Carrier of the Year by Dollar Tree Distribution. This honor comes down to the hard work of our drivers, collaborative approach of the dispatch department, and timely reporting provided by our office staff,” said James Ferrone, Executive Vice President at Diamond Freight Distribution. When Diamond Freight made its first trucking move 30 years ago, our goal was focused on establishing ourselves as the premier Intermodal service provider within the Port of New York / New Jersey. Our commitment to this has never wavered. Through the years, we have witnessed the industry’s growth and economic fluctuations firsthand. Adapting in both positive and challenging times has allowed us to continue to grow in transportation and expand our services into storage and container sales. We now offer a full suite of trucking solutions to help each of our partners succeed. Diamond Freight has won awards on its unbeatable service. Our relationships continue to grow by working together toward a common goal – making your business run smoothly at all times. Our efforts are firmly focused on delivering reliable service at a competitive rate. Source: Diamond Freight Distribution, Inc.